We are coming to a strange anniversary. One year ago, things fell apart. What happened next – a hospital-free year with Julianna – has been beautiful and unexpected. These days, I try to live in the present. Frankly, there is a lot that I don’t want to remember. There’s something about anniversaries, though, that demands reflection. I wrote this letter one year ago. Most of it is copied below (italics), with updates and commentary in blue. This anniversary, we are celebrating how far we have come. We cannot take any of this for granted. You may or may not know that Julianna was hospitalized almost 3 weeks ago for another respiratory problem. She is better now and will come home tomorrow. 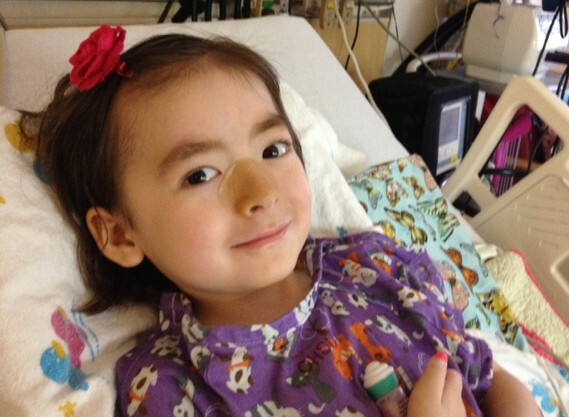 In 2014, Julianna spent 66 days in the hospital. This was her third PICU admission in ten months. We tried so hard to keep her out of the hospital, but it seemed like nothing was working. It has been a really difficult year for us. We have been in survival mode for at least the last year and have thus been largely non-communicative – even with our closest friends and family. We need your support, though, so we wanted to start by letting you know what we are facing. For a long time, we kept everything to ourselves. It was too painful to put our reality into words. This e-mail was one of our first attempts at letting others in. Julianna turned 4 in August. She is a bright, kind, funny and amazing girl who happens to have an awful, debilitating neuromuscular disease. The worst part of her disease is that it affects her breathing and swallowing – these are the things that ultimately shorten lifespan in people with neuromuscular disease. I recognized these signs before anyone else. It’s the double-edged sword of being a physician and mother. I struggled mightily against this knowledge. I told myself that I was being paranoid — maybe J wasn’t getting better because I was too pessimistic. It was easier to blame myself than to admit that J’s disease was really, really bad. We have come to the awful realization that Julianna will not live as long as we want. It was devastating, getting to this point. Once acknowledged, there was new pain, but also freedom. When you’ve come to terms with your worst fear, it loses some of its power. I’m still afraid of what is to come, but it no longer paralyzes me. We are on borrowed time, and it can’t be wasted on fear. We don’t know how much time we have with her – it could be months, it could be years. Still true. I didn’t think that we’d make it through the winter, and now we are facing our second. She is so fragile. But maybe we can do it again – God willing. If you have been around Julianna, you know that she is one of those kids – her spirit is incredible and resilient, and she is wise beyond her years while being delightful and funny at the same time. She is exceptional. I have struggled with this as well – b/c it always seems that the children who face the most serious illnesses are also the most special. If I had my choice, she would be more ordinary – and we would be able to see her grow up. I have come a long way in accepting what I cannot change. The same God who made Julianna bright and lovely also allowed her to have a cruel disease. I believe that children who are asked to endure serious illness are given strength that the rest of us cannot understand. They are special. I think it’s God’s way of saying “I’ve got this. Just follow her lead.” So I follow. Things are complicated here. It’s not an easy time for us but we are trying to trust God. It’s the only way. Prayer has given us this beautiful year. When I wrote this letter, I could not have imagined that I’d still be sitting here tonight, by Julianna’s bed, waiting for her to fall asleep. Last night, I gave her one last hug as I tucked her in. J: I will love you forever. M: I will love you forever. J: I will always be your baby. M: And I will always be your mom. M: Yes, even when we die. J: Mom, will you miss me when I die? M: Oh, Julianna. I nod. J: I don’t want you to be sad. I want to give you flowers so that you remember me. M: Julianna – it could be a long time – you’ve done so well. Do you worry about dying? J: Nods. Sometimes. I’m used to things here. I’m not used to dying. M: Of course not. No one is. We only die once. Sweetie, I don’t want you to worry about it. And we prayed. Prayed that she doesn’t ever get sick again, and that she won’t be afraid of anything. I thanked God for the joy that she brings and told Him how much we love her. I stayed there, kneeling by her bed until she fell asleep. Charcot-Marie Tooth (CMT) is something I rarely see in print. So when it showed up in trending articles, it caught my eye. It’s a disease that has severely impacted family members on my Dad’s side. I am so grateful and thankful for my flat feet. I made the decision not to have children very early in my life. Not because of CMT. I think what your family is doing is beautiful. You have chosen quality of life and living in the moment. Kudos to you! And God bless you! I couldn’t continue to read some of the articles passing judgements. Guess what people? It’s not your decision. And guess what else, no decisions in this situation are easy or come without doubting every turn. Each family needs to make the best decision for them and their own situation. It’s apparent the love and faith. God bless you and your beautiful daughter. It is very clear you all have so much compassion for J and she is very blessed to have you two as parents! We will be praying for you and your sweet little girl! I cannot even come close to imagining what you and your family are going through but I can say that your willingness to honor your daughter’s request is the second greatest act of love you can ever provide her (the first was bringing her into this world). I am an adult Pulmonary and Critical Care physician so I see every day patients who are unable to breathe well. I also see what our patients endure in the ICU while we try to “save them.” Unfortunately, the public does not witness many of the interventions that we subject people to (like NT suctioning) and therefore do not understand the pain and discomfort associated with many of them. Perhaps if they did, they would listen when their family member when they say that they are tired. I applaud you as a mother for hearing your daughter. I applaud your selflessness and sacrifice by placing her needs before yours. I applaud you as a teacher for raising such an intelligent and wise young girl. I applaud your bravery to standing up for your daughter and for sharing your story. I hope in the years to come that you will continue to be at peace with your decision to honor Julianna’s request, as it took great courage to do so. Don’t ever let anyone tell you that you made the wrong choice, because you didn’t. By supporting her, you allowed her to live the way she wanted to before her next journey and that’s all she could ever ask for. Thank you for taking up the most incredibly difficult task you likely ever will face. And thank you, too, for allowing your story to be shared in the media – It had to be tough to put it all out there. People need to understand that while life is a gift, there are NO guarantees, and each person has the right to decide how he/she wants to spend time when facing a disease for which there is no treatment – except painful interventions to treat symptoms. Your daughter sounds like a truly remarkable little girl, and I’m certain that in just these few achingly short years she has touched more lives than most people do when living deeply into old age. We have been in your shoes, and while we, too, were willing to do everything we could to ensure that our daughter got every possible chance, we also knew that if her destiny was to succumb to her disease, we would do everything we could to protect her dignity and comfort. Please be assured that your family and your daughter will be in our prayers and thoughts. Just wish there were something more that would help. I just saw your story on CNN, and your precious Julianna is indeed a special spirit. I am amazed at the wisdom in one so young. I had a sister that had Marfan’s Syndrome, and was told she’d in all likelihood die before she was 30. Cindy embraced this sentence, and lived her life to the fullest, packing as much as she could into her shortened lifespan. Sadly, she didn’t make 30, she only made it to 22, and passed away in 1974. I believe your little one is doing much the same as my precious sister did, living her life on her terms, as best as she can. And you, dear Parents and big brother…you too are very special, and very courageous. I am sorry for your pain, sorry for the loss that lies ahead, but so glad for you that you have the clarity to treasure each moment as it comes. I lost my beloved parents in 2011 and 2012, and that was the point at which I personally no longer feared dying, because I knew I would see them again. Michelle, your words where little Julianna said she’d be standing in front of the house to meet you…they made me smile through my tears. I am sorry you will lose your little treasure far too soon. Blessings upon all of you. Hi I read your story in Foxdc.com.my heart broke the more and more I read the article. You and your husband are very brave and God bless you and little angle, Julianna. I will keep her in my prayer! Is it possible that I could visit Julianna in the hospital and give her some gifts? God, chose a very special family to send this angel to. You have not let Him down. He has let you borrow her and soon she will be reunited with Him and her heart knows this. May your continued faith help you through these trying moments. And may you believe that you too, shall be reunited with her one day. God bless. Your story truly is the epitome of FAITH. I am so incredibly touched by your story. Your family is an inspiration to so many. I pray that Julianna has many more blessed days with her family. God Bless all of you! Let me just say that apparently none of those people have seen the photo that leads the CNN article. The moment I saw Juliana looking into the camera it took my breath away… the depth of her awareness and focus and intelligence and, for lack of a better word, wisdom shines through so sharply in that photo that I instantly understood why you show her the same respect to make her own choice as you would an adult. So I have a small gift for you, Juliana, that I think you will like because you so much enjoy princesses. It is a book I wrote for my own daughter(she is 8 now) to help her learn how to live joyfully in a dangerous world.. which is a lesson you have already learned! I also wrote it to show her that just because she is young that doesn’t mean she can’t do important things, which you have already learned too! It is called The Legend of Ninja Princess and it has not been published yet, but you can get the first three chapters by going to http://www.thelegendofninjaprincess.wordpress.com and clicking the link there. If you like the first three chapters, please send me an email and I will send the whole story in PDF form to you. Thank you all for making me smile and cry at the same time, and best wishes for the future. You are doing the right and beautiful thing with Julianna. I should know. My husband Xenophon Louis “Zenny” Speronis died from Charcot-Marie-Tooth disease at the age of 84 in 2010. The last several years of his life he wanted to focus on living, not on dying and wanted nothing to do with hospitals and doctors. I wrote a book about that time in our lives, “My Love Was Greater Than My Fear: Freeing My Husband Completely From The Healthcare System and Home Deathing Him Naturally”. If Julianna does pre-decease you, (you don’t know – she made live to be an old lady and teach us all many profound lessons), then you have no idea what the depth of your grief will be, but you will be able to hang onto the fact that you gave her the best life possible if you don’t allow fear, doubt and guilt get to you – I know. May God bless you, and give you strength and courage. You’ll be on our prayers, and the prayers of our children. Dearest Friends and Believers in the Eternal~ What a wonderful platform the coverage from CNN has provided for your story and the determined love you share. As Christians, we understand the “Hope that is within us” gives us courage to face challenges with the truth. Fear, uncertainty and our future days without our dear one is part of the human condition. Medical science can only provide an ever-changing series of temporary hope. You have grasped the True Hope that all believers share, and many find unanswerable. I am inspired by your forthright honesty and frank words of sincere love. Your precious Julianna’s life here on earth was a gift, not only to you her parents, but to all of us who now know her story. God speaks in small ways and through small persons, to those who have ears to hear. One thing is sure…..We *will* be changed because of her life! I cannot even say how much gratitude I have for your decision to leave your daughter’s life in her own hands. She may not understand death — but who does? She certainly understands life! As someone who has watched over family members who had no such choice, you are absolutely doing the right thing encouraging your daughter to make her own choices. I cannot even begin to understand what your family is going through, but your decision to make this public will undoubtedly help others, both personally and eventually legally. Little Julianna, you are already an Angel, you are just here on earth. I wonder what Angel-job God will have you do when you get to Heaven? You are very smart, and very good at comforting. I bet it will be a very important one. When Jesus comes for you reach for him. And remember, all of these tears we are crying will make the biggest rainbow ever, and that rainbow will keep you attached to your family here so they know you are safe and happy, and you know how much they love you. You are so beautiful. I think I’m going to go out and buy a tiara and a feather boa and be fabulous just for J. I volunteer with sick kids and they are some of the funniest, brightest, quirkiest humans I have ever met and I hold them all in a special place in my heart. I just spent a few hours reading your entire blog and J is a girl after my own heart! She’s full of sass, spark, love and joy. Thank you so much for sharing her with us. I’m sure you know your story is lighting up social media today. I’ve seen it on two major sites so far, and I’m sure it’s just the beginning of introducing your family to the rest of the world. I’m an avowed and proud atheist. I’ve never seen proof of any god or deity, or heaven or hell, so none of that belief system informs or guides me as living my life to be a good person. But regardless, your story is both heartbreaking and inspiring. You have my utmost sympathy for what you are going through, and hope that you and your girl find peace in your beliefs. For what little it may be worth, I applaud your abiding by Julianna’s request, which is no doubt harder than any person or parent could imagine having to make. You’ve done all you could and have made a painstaking yet honorable decision. While whatever if anything comes next is an unproven unknown, we know this life here, now, is real, and demands our care and understanding – you’ve triumphed in both. In many ways, I do hope for you that I’m wrong, and that you will one day – somehow – see your girl again running towards your open arms. It is the least you and your family deserve. I am praying for you all that god puts your hearts and mind at ease. If Julianna wants to be in HEAVEN that is where I would allow her to be. I am a parent of a 9 yr old, No I have not been in this situation so All I can do is pray god heal your hearts. You have been put into a position that no parent should ever have to contend with and I believe you’ve made the right decision. Sending thoughts of peace and comfort to you and yours. 안녕하세요… 엄마가 한국분이신것 같아 한국말로 남겨요. 저희 6살 아이도 SMA type2에요. 기사보고 반가운 마음에 블로그 들어와 글 남겨요. I come from a family where at least 10 people have had CMT in the last 3 generations. It is a misdiagnosed, misunderstood, and insidious disease (even in its less radical presentations). I am so, so sorry that your family and especially your little girl has had to confront this disease. GOD bless you all. J cracks me up! I’m sorry you’re going through this! I wish I could take it all away. It seems that your decision to let her go to heaven vs the hospital has brought you peace. I’m so happy for that. I don’t know the right words to say, everything that I type seem so inadequate. Here’s a virtual hug! God Bless You and your family. May He continue to give you strength. and the courage to deal with their own acutely ill child the way that you have. May God bless both of you and may God watch over Julianna on her journey. I cannot commend you enough for allowing your lovely daughter to choose her own path in life – and death. My husband has CMT; it came on him when he was in her early teens, and he was told he would be in a wheelchair by the time he was 25. He’s 72 now, but sometimes, listening to him groan in his sleep, and knowing the constant pain with which he suffers makes we weep. How much more you must weep for your daughter! Let her run to the light! You will see her again, and be with her forever, and forever is a very long time. You have a beautiful girl and you are a beautiful family. I read your story on CNN, and for what it’s worth, I want you to know that I support whatever decision Julianna and you make when the time comes. I realize I’m just one person that you don’t even know, but I’m sure there are many, many others that feel as I do, and I want to make sure you feel supported. You will make the right decision no matter what that may be. God will give you the strength to you and your family to go thru this difficult time and you will comfort other families in similar or same situation then you. She is amazing girl that God give you to take care for a while and you and your family and hospital member has done a wonderful job. I am a believer in God and I went thru very difficult time in my husband ill and God give me the strength every day. I will keep you family in my prayer when the moment comes. I read an article on you and your family this morning on CNN and it moved me to follow you and Julianna. You’re having to deal with something every parent dreads and spends at least some time lying awake at night worrying they might have to someday face—the death of their children. I have nothing but admiration for you and Julianna who have had to deal with more than any parents and children should have to. For the naysayers and the critics, all I have to say is that it’s easy to sit back and judge others without wearing your shoes. Morality and ethics come easy when you’re on the outside. For me, the fact that you are including Julianna in the decision process is more humane and logical than if you made a decision for her without factoring her into the equation. Her age doesn’t mean she’s mute and has no opinion. Sure it’s a perspective limited by only four years of experience, but she’s alive and thinking and she knows enough to be part of that process. The naysayers don’t have to live looking through her eyes every day . . . or yours. My prayers and best wishes go out to you. For you, and for Julianna, and her brother—it’s no easy thing for him either. You are inspiring to those of us who don’t have to deal with this life and death struggle. Thank you so much for sharing Julianna and your faith and trust in God with all those who have been hurt, are hurting and all those who can pray. It is not over until God says it is over, He is the Creator and the giver of life. I speak life into Julianna’s body, may the God of compassion touch her, head to foot and may the resurrected power of the blood of Jesus flow through every cell in her body….bringing life!! They may physically leave this earth, but their spirit and memory lives with us, that no one can take away. Have no idea what you guys are going through but you’re not alone… You have everyone’s support from all the people who took time to leave a comment. Would like to send something to you guys if that is okay for your daughter, my email is on this post. My heart goes out to you all. I’m the guy who usually questions why people believe in god and heaven, or why some religions refuse medical treatment. After reading your story, all I feel is profound sadness and a sublime admiration for you and your family. I only hope I could have a fraction of the strength you do were I in similar circumstances. Please don’t listen to the naysayers. I wish you peace. I just learned of your family’s story today. I’ll admit at first when I read the article in the news I was upset at your decision. But as I continued to read the story and all the hospital visits you guys had been through I began to picture my daughter’s face. I can in no way compare my daughter’s condition to yours. I am a mother of 3 children 19, 17 and a 3 year old. My youngest was born without a thyroid. We found out about two weeks after she was born. Up until then we had several hospital visit countless hours under ultraviolet lights and tons of blood work trying to get her bilirubin numbers down. After the diagnosis we began making monthly visits to the doctor and every three months visit to children’s hospital for labs and a specialist. Every single visit meant blood work and having to hold her down while she screamed. So I know how awful and heartsickening those screams are. But I know it still doesn’t compare to the procedures your baby went through. But having just this little bit of knowledge and experience I FULLY UNDERSTAND AND SUPPORT your decision. May God bless you and your family. You are in my prayers. Steve, my brother in Christ. I applaud your strength and commitment to your beloved wife and beautiful daughter. His light is shining very strong for all to see. As a visual person, I hold tight to the picture of those who have died before me standing on the other side waiting anxiously and excitedly for me so that they can introduce me to Jesus, who they have already met. Hope this helps. I will continue to pray for you, my brother in Christ. Thank you for sharing your story. I’m a child psychiatrist and a mom and I was incredibly moved when I read about Julianna’s story on CNN. I think you and your husband are making the right choice to abide by her decision. It cannot be easy. I pray for your family. And I pray that Julianna will have many more happy days. I have been a hospice social worker for 24 years and I know you have made the right decision for your child. Life is not about quantity, it is about quality . God has given your daughter and your family the wisdom to know this. You are all in my heart and prayers. Bless you for sharing your story so many, many others will see that the most difficult choice can be the most loving, selfless and peaceful choice to make. Dear Michelle and Steve, I just read the article on Julianna and her wish to not go to the hospital again. She is a beautiful little girl and wise beyond her years. I support your decision to adhere to her wishes. Unless someone is in a situation the same as yours they have no right, let alone a basis, to say you are doing the wrong thing. I was a nurse for over 40 years before I retired. I can’t tell you the number of times I have cried over a sick child. Bless you. Be at peace. I sit here trying to figure out what to post , say , to a story such as this . As a parent I am grateful every day for the health of my children and wish beyond words that children such a Julianna never go through something such as this. Such a brave young girl to say what she did. I ,as a parent , don’t know if I would be able to be as strong as hers when that was said. I was brought to tears reading this. I’m trying to find the right words but it’s very hard. Enjoy what time is left and I hope u know that people out here are with you. 저 웃고 있는 맑고 아름다운 눈을 보고 있는데 왜 난 눈물이 흐를까요.. I will pray for your peace and joy and to be held in His arms during the rough times. I am a transplant nurse and also a mom, and I am inspired and blessed by your sharing of your journey. God blessed you with her, and she with you. Blessings to you all. Michelle–over the years, I have longed to get back in touch with you–every Christmas, I see your name on my list of people to send a letter to, but there is no working email, and I wonder how you are doing. Last night, I started reading a CNN article about an incredible family when suddenly I stumbled across your name. I thought, “Could it be the same Michelle Moon?? ?” And indeed it was. I would LOVE to reconnect, although I know you are dealing with so much right now as a family so I want to respect your privacy as well. But please know I am thinking of and praying for you all. I am so glad to be back in touch even in this small virtual way, although I wish it was not accompanied by so much heartbreak for you and your family. You can email me anytime now that you have my information. Keeping you in my thoughts and prayers. I just read your article on CNN and it took my breath away. I wish with all my heart that something could be done for your precious little girl. She has had to endure things that no one, least of all a child, should have to endure. You are incredible parents to allow her to have a say in what happens in her life. It does not matter that she’s so young – she has wisdom well beyond her years. I will pray for your family, that you have strength when you need it and for Julianna to pass peacefully. I am deeply humbled by your family’s story. I am sharing it with everyone I know. I have 2 daughters a 3 and 6 year old, they and I prayed for your family and Juliana last night. My daughters wanted to tell Juliana this ” We think you are a brave, funny, and fancy girl. We wish you the best. We think death is scary but hospitals are too. We are going to pray for you so that death wont be so scary. We would love to play with you and be your friend.Can we send you something?” They cried a lot and said they want her to live and play and know her mommy will be sad. I can only imagine how difficult this is for you, sending love and light your way. If possible please email me an address or PO Box so my daughters may send Juliana something. After reading your story I am so thankful for your families unbelievable bravery and strength in telling and standing by the decision your family has made. My heart aches for you all as I know this is such a bittersweet time for you all. Having walked such a difficult journey that is similar to yours with our first born child. I remember my own family members who did not understand these most life altering unimaginable decision we were having to make. You are giving a voice to all of us families who walked this same journey that I could not have imagined until I was having to live it. “As having walked a walk with my child who, like in this case, was not curable but able to survive with no quality of life and for all purposes would be in a vegetative state and inevitably would pass shortly after in a manner that most of us could not wrap ourselves around. We choose to forego further medical intervention as a means to end our child’s pain and unimaginable suffering. The thought of any and every parent for their child, when not having to walk in this families shoes, is always hope, survival and the will to forge forward at all costs. Then something like this happens and you see a part of you in so much pain and looking to you to make the best decisions for them, you are forced to make the best educated, loving, and heart wrenching choice because you love your child more than life it’s self. The most amazing thing happened the local news station reached out to me and said thank you for sharing and because of the post they had noticed within 1 hour after the post 74 very negative comments were taken down by those who made them. I explained they should not thank me but should thank your family as you are the brave ones who gave a voice to all of our families who are missing or living with their beloved child. There are no words to take away your pain. Know that there is something greater than this out there, a place where pain and suffering doesn’t exist. Your family is an inspiration, make the most of your moments, but be reminded that one day you will all be together again. Julianna, is an incredibly witty, loving and strong girl. She has been faced with challenges and has overcome them with grace and style. You should all be so very proud of her as I am sure she is so proud of you all for giving her the choice. Would sure love to send her a little something, anyway to do so? You are a very brave girl. Although we haven’t met I just want you to know that you are in my thoughts and I wish you the best. I think your story is not all that unique. The disease process may be but the decisions-not so much. I am not here to judge or preach. I just want to send you good thoughts on your family’s journey. I hope, regardless of what or how it happens, she’s not suffering too much. Good luck to you and THANK YOU for sharing your story!! I applaud you and your family for sharing this with us, as a mother I can not even imagine what you are going through. My thoughts are with you and with your family . God has given Juliana a peace about Heaven, Jesus spoke of this several times. Keep hoping Julianna, your faith is not in vain. Luk 18:16 But Jesus called them to him, saying, “Let the children come to me, and do not hinder them, for to such belongs the kingdom of God. God bless the Snow family. They have touched my heart in a way few have. Julianna is wise well beyond her years. I applaud the parents in making this difficult decision which I agree are in the child’s best interests. Julianna has been a blessing to all of us who know her story. Thanks for sharing it. My heart hurts for your family. Julianna is indeed a very special child. I am not judging you as I would do the exact same thing if I had a child. You just don’t want your precious baby girl in pain anymore, I can understand that. Just know that my mama who passed away four months ago is also in heaven and she will also help welcome Julianna as she adored children. God Bless you all.